It was a quiet afternoon. Cam was in his crib, taking a much-needed nap. 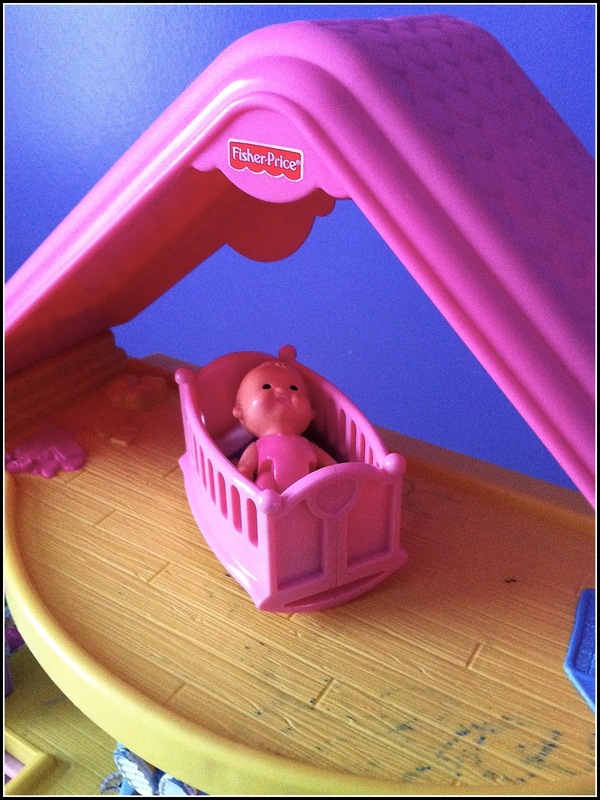 Lilly was contentedly playing in her room with her Fisher Price dollhouse. Though it was chilly outside, golden sunlight was streaming through my windows. It felt warm and cozy in my (momentarily) peaceful house. 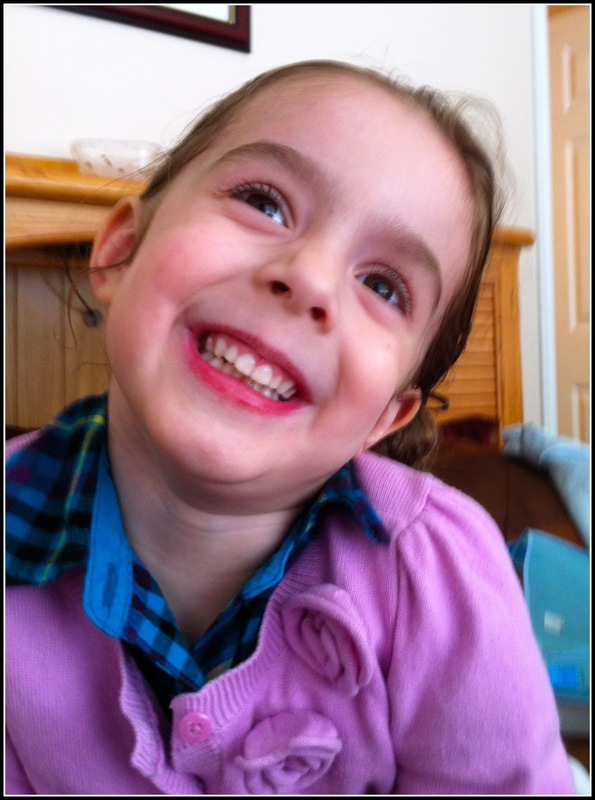 I went into Lilly's room to check on her, and was met with a big grin and an exuberant: "Mom! Come look!" "What is it, Lilly?," I asked, curious as to what my smart and witty kid had been "up to." 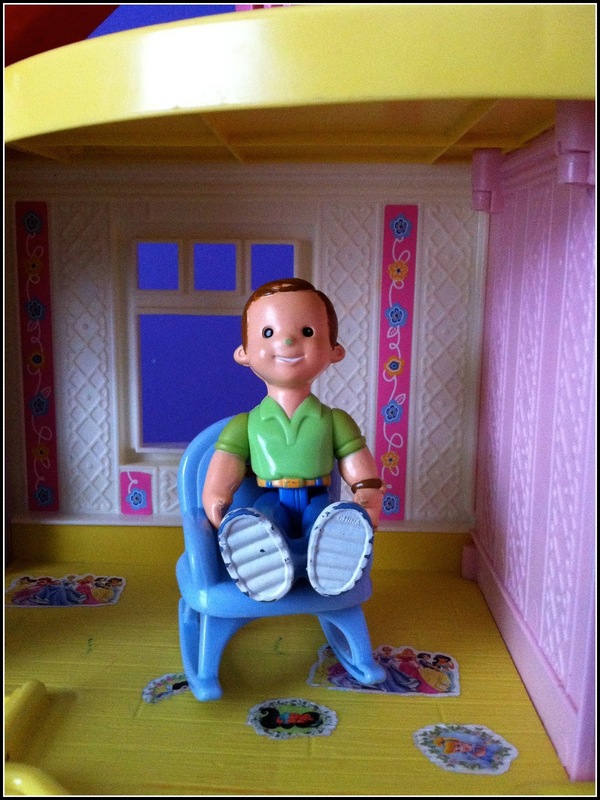 "I was playing with my dollhouse and the family, and I figured out their places. I put everyone where they're supposed to be," she answered. Then my Lilly-Girl asked, "Would you like to see?" OH BOY, WOULD I!?! I sat down next to Lilly and said, "Show me!" First, she pointed to the small, plastic baby in the cradle. "I put the baby in her room. In her cradle. She's napping, because babies sleep a lot." "Very good, Lil. That's exactly right," I replied. Next, she pointed to the dad with the nerdy hair and the worn-down nose. "He's in his favorite chair. He's watching sports on TV." I laughed jovially and in between giggles, said, "That's perfect, Lilly! That is where YOUR dad would be!" She smiled at me and said, "But wait! There is another place for the daddy." She moved him to the kitchen and plopped him down at the table. "A daddy's place is in the kitchen, too! Eating all the food," she said, happily. I clapped and exclaimed, "Excellent! You are right!" 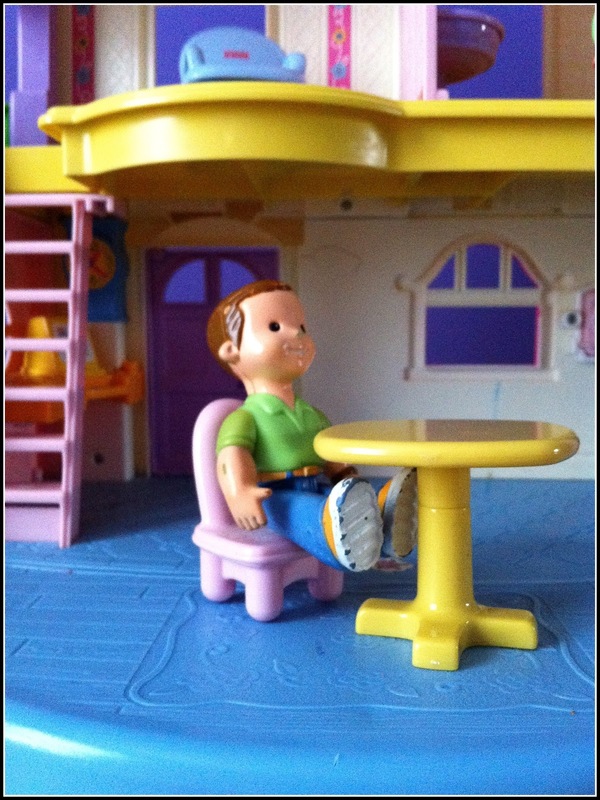 There was only one Fisher Price doll left. One quintessential piece to the "family whole." Now was the moment I had been breathlessly anticipating since the beginning of Lilly's "show and tell"--the placement of the mother. 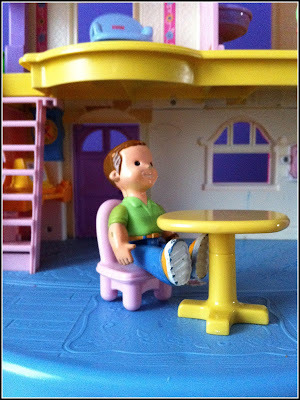 Where-oh-where did my preschooler put the toy mom (with the green shoes that DO NOT match her outfit)? "Lilly!," I gasped, "the mother's place in on the toilet!?!" She grinned at me, pointed her little finger, and said, "You got it!" I confess I thought about the "mom on the toilet" throughout the remainder of the day. Does Lilly think I spend all my time in the bathroom? I guess between cleaning it, getting ready in it, and "hiding" in it, I AM in there a lot. Does she REALLY think a mother's place is on the toilet!? You know what I realized by the time night fell? It doesn't matter where the place is--bathroom or not! The point is I HAVE a place. I have a place in my family. I have important responsibilities in my home. I have a place in the lives of my most treasured friends and loved ones. I have a place in the world. I have an opportunity to serve and love those around me. And, most significantly, I have a place in the heart of a beautiful, brown-eyed, five-year-old girl. I matter to her. So funny! In our old house our tiny "master" bath is one of the only places that still has a key to lock the door, so it is my hideout too. I wonder where my little one would say my place is. I just found and followed your blog via Mingle Monday. Looking forward to your future posts! I really love this post, not only is it funny and quirky, but at the end you point out the importance of the day to you. It is one of those sweet days you will always remember. In our house, Daddy's place would be on the toilet!! That man could live in there I think. ;) Thanks for leaving such a nice comment over on my dusty cobwebbed blog. Oh my goodness, the holidays are coming and I just haven't been able to keep up with everything we've been doing and post about it! I still have a jack-o-lantern on my header over there! Eek!!! Hopefully I'll have a chance to sit down and make some new posts soon. We made such cute Thanksgiving crafts that we never mentioned. Ugh! You're way better at this blog thing than I am! Hope everything is awesome with you and the fam!! Happy Makes My Monday...thanks for linking up, Mama Leisha!! So sweet. I love it! I hope that you had a wonderful weekend and are having a great week so far!! Thinking of you lots n' lots!! Adorable and such a funny post. Of all places to be, huh? Yes we do have a place - so true. I am a new follower from Tiggerrific Tuesday. Would love it if you can also join my Kids e-Connection blog. Thank you! oh my. we know what you do all day long! ; ) kids. where do they come up with this stuff? !